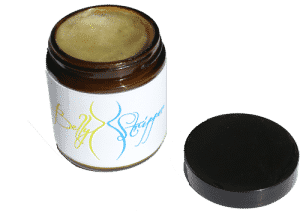 Belly Stripper is a topical cream that is applied to the abdominal area at night. It is designed to pull toxins from your body through the skin, which is your body's largest elimination organ. It's made with all natural and organic materials, including the Herbalix™ Sea Blend Preservative System. It contains no synthetic anything. A proprietary preservative made from a blend of herbs and plants harvested from the land and sea. Free of synthetic chemicals; proven extremely effective in stringent lab studies conducted in the U.S. It smells like herbs, not like something from a pharmacy shelf. It's yellow-green in color and has a consistency like semi-solid coconut oil. I've got visible abs – No “six pack” yet, but I can clearly see the bottom of my rib cage (more visible in top photo) and the little fat pooch by my belly button is smaller. After using the Belly Stripper for several months, in October I developed a pea sized cyst right over my liver. I cleaned it out, and it filled up again. This happened repeatedly over the course of three weeks, with a small amount of discharge for a couple more weeks. I don't know what came out, because I didn't get it tested in a lab, but something left my body that should not have been there. I've seen a similar pattern on a smaller scale each time I've started applying the detox deodorant on a different part of my body. Under advice from Mike at Herbalix, I used it on my spine for a while, and developed some acne that cleared after longer use. When I started apply it on my thyroid area, I broke out on my neck and shoulders – not where I had applied the detox treatment, but on the connected lymphatic pathways. I firmly believe these products help your body to help itself clean out toxins. Why is removing toxins important for weight loss? As a form of self-protection, your body sticks “bad stuff” out of the way in your fat cells. You loose weight, and those substances are released back into your system. (This can be verified by people who've had acid trips years after no longer using acid as a result of rapid weight loss. Bad juju.) Your body reacts by putting the weight back on to protect itself, and you get frustrated because you can't loose weight and keep it off. Until you clean out toxins, it's really, really hard to maintain weight loss. I haven't been this weight for years, and the last time I was I had to run myself into the ground with exercise to drop the weight. 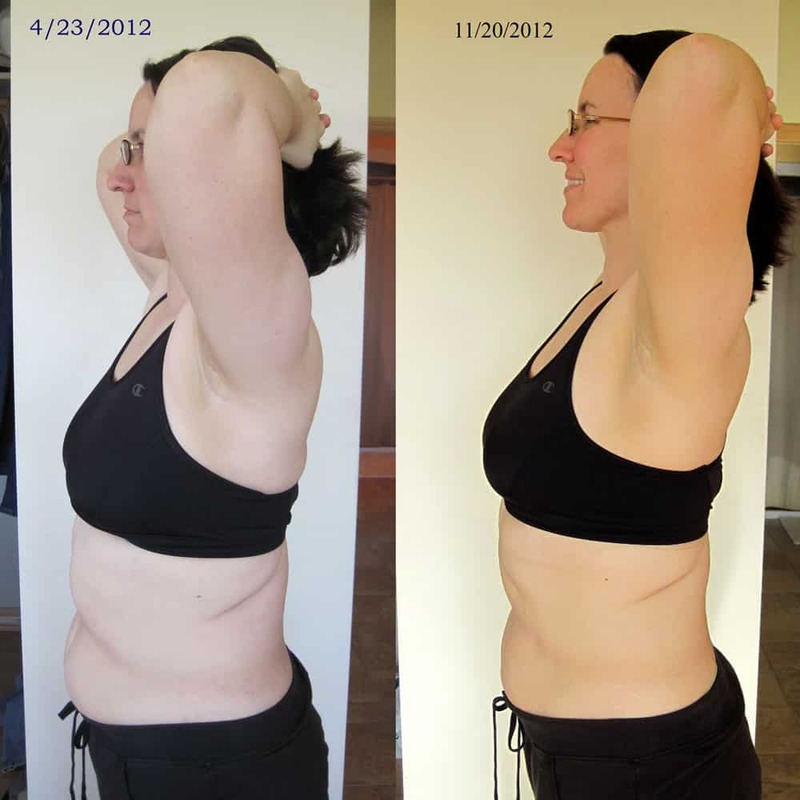 When I stopped exercising like a crazy woman (burnout, anyone? ), the weight came right back on. What I'm doing now (see “Switching on a Healthier You“), I can live with, easily. I'll be trying (and posting about) other detox options. I try to remember to breath deeply, go barefoot in warm weather and I use cold rinses in the shower and dry brush, but there are more methods you can also use. As we head into what is often a season of indulgence, make sure to take time to give your body some TLC. If you'd like to try Belly Stripper yourself, you can click on the image below, click here to visit Belly Stripper directly. One jar lasted me from April through October (longer than the website indicates). A little goes a long way. The price is currently $80, so if you do the math, that's $16 per month or about 50 cents per day. Given my slow but steady progress, I decided to become a Belly Stripper affiliate, so I do make a small commission from your purchase. Herbalix provided me with my first sample jar, but I have since purchased my own product. All opinions are my own, as are the non-edited photos of my before and after caboose above. If you have a more pronounced tummy, you may see faster results, but I tend to carry more of my weight in my hips and thighs so it took a while for me to see the changes. Please leave a comment below if you have any questions about my experience, and I'll do my best to answer them. Thank you so much for your time and diligence and for writing such an exceptional review of Belly Stripper! I laughed when you talked about the acid trip because I had a similar experience with using the cream. I quit smoking ten years ago and used Nicorette gum, which I was addicted to for four years. After using Belly Stripper for two weeks, each morning my mouth and lips were numb tasting like nicotine. As I lost belly fat, the taste diminished. 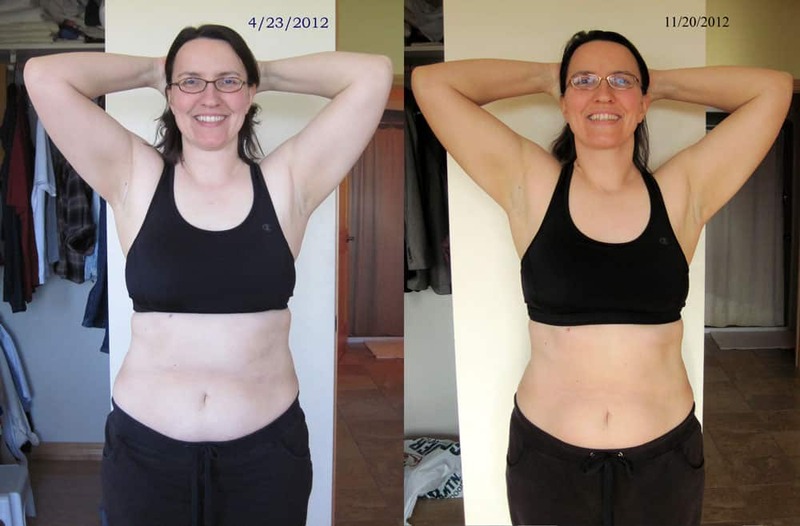 Kristin – thanks for sharing your experience. I had a discussion on the FB page with someone who asked if what I was experiencing was just an allergic reaction, because they didn’t really believe the cream would work as it says, but your experience demonstrates a pretty clear cause and effect relationship. Hi there! Did you find you had much progress using your first jar? I wish I could say that, if it works, I’ll order more and more… but sadly, my budget will dictate otherwise. So, it’s going to be one jar (unless I magically fall into some cash!) I hope it’s not going to be a case where just one jar won’t be enough to make any sort of difference. One jar lasted me from mid April to mid November. I just started using my second jar last week. I’m 5’8″, not huge in the belly but not tiny, either, so you can kind of guess what your usage might be. The usage rate on the Belly Stripper website is base on 1 teaspoon per day, but for me, if I applied that much to the front of my abdomen, most of it would just come off on my pjs. I used just enough to get a light coating from just below the breast area to just above the top of my bikini underwear, making sure to rub in it thoroughly. BTW, you want to make sure to wear pjs you don’t mind getting stained a bit, as over time the oils tend to build up. I bought a couple of men’s extra long cotton t-shirts off the clearance rack and cut the neckline to a v-neck for comfort. Cheap and easy. That’s really good to know! I’m glad you don’t need as much as they’re saying, I’d hate to go through it that quickly. Well, here’s hoping!! My fat resides in my thigh/bum area primarily (I’m the classic hourglass) so I hope this will help that too. Belly fat isn’t my problem… but I am heavy metal toxic, so getting ANYTHING out of my fat cells is critical. It’s so slow. When I was talking to Mike and Liz about a friend of mine who would like to loose inches through her hips and thighs (she’s also very hourglass), Mike said that it could be applied to that area as well to accelerate the process, but the area over the liver was the most critical. Wonderful, thanks for that advice. Gosh, I can’t wait to get mine now! Super pumped. I have a lot of garbage in my system… and it’s ever-so-slowly moving its way out. I pray this helps!! It’s one piece of the puzzle – if you’re still loading lots of garbage into your system, this will not be a miracle cure. In my case, I’ve been slowly making changes for the last several years that have led to improvements. I had hit a plateau in terms of weight loss (before I started using it), and then I started loosing with the cream use. Also, I have never loss weight in quiet the way that I did this time around. The midsection weight loss was much more pronounced. I hope it works as well for you. Oh, I eat a diet that’s 80 – 90% clean and I don’t use any products with chemicals or anything else like that. We live a very healthy, clean lifestyle. Quite a long time ago, I chose to eliminate gluten, sugar and all unnatural ingredients from my food, cosmetics and everything else. Unfortunately, I was exposed to heavy metals and hidden mold over a period of time (unknowingly, in my old condo) and I’m now dealing with the fallout from metals, candida and adrenal fatigue. The detox process is a slow and complicated one… and I know there’s garbage trapped in my cells that is having trouble getting out. SO, this is worth a try to see if it helps! I asked my doctor if she’d be okay with me trying this and she said it’s fine… so let’s see what happens! I’m wondering if you can help me get in touch with the folks over at the company, though. I placed my order using your link but I haven’t gotten a confirmation email and I have no clue on how long it should take to ship, etc. The email form on the website doesn’t work, nor does the phone number they have listed on the site. (I’ll be honest, it makes me nervous!) Any advice? That’s great that you’re eating so well and taking care of yourself. I just don’t want anyone to get the mistaken impression that this is some sort of “miracle cure” – like the old practice of buying Indulgences to make up for your sins. I’ll let Liz know that their email form isn’t working, and that order confirmation emails would be a plus. They’ve been testing this product for a while, but just launched the website. It’s still got quite a few bugs to work out. You can contact Herbalix (parent company of Belly Stripper) directly at info@herbalix.com with any questions or concerns. i’ve yo yo’d in weight all my life.. i’m very small now.. but have lots of loose skin.. and LOTS of wrinkles and sagging!!! thanks, Laurie! Here’s to achieving a stable, healthy weight! Does it also work on reducing the male belly fat? Thanks! Yes! Mike and Liz from Herbalix have both used it with good results. They even tested it on their older pets and found they they ditched some of their middle age spread. It also helps increase blood circulation to area naturally, which has other helpful side effects. FYI, the discount offer doesn’t seem to be valid anymore-i put “freedetox” in and it didn’t give the free shipping or free deodorant, just a price of $74.99, plus shipping. It was supposed to be valid until the end of the month. I’ll contact them. 866-387-4222), they can get this straightened out for you. Hmmm…I wouldn’t recommend the Crystal Light. Have you considered a probiotic beverage such as kombucha, kefir or kvass? (https://commonsensehome.com/water-kefir-versus-kombucha/) These would help improve gut health, which is critical for the conversion of T4 to T3 hormones, and could dramatically improve your immune system and overall health. Until the end of January, the Belly Stripper is supposed to be on sale for $74.99, with free shipping and a free sample of the deodorant, but Susan said she didn’t get the free shipping or the deodorant. I dropped the ball and forgot to email and check on this, but sent a request to Herbalix today to find out what happened. Hopefully that will give you some ideas of where to start. I’m working on an e-book right now about common sense things you can do to improve your health, so that might be something you want to watch for as well. Hi, I live in Kuala Lumpur and would like to order your product. Do u you ship to Malaysia? If yes, how much will the shipping charges be and how long does it take? Thanks. Harjit, you should inquire directly on the Herbalix site. You can email them at info@herbalix.com for questions or comments.